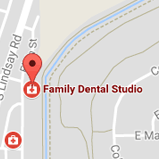 Michelle makes sure Family Dental Studio runs like clockwork. She is in charge of the front office, where she schedules appointments, coordinates insurance and billing, and oversees the rest of our team. With more than 15 years of experience in the dental field, Michelle is an excellent resource for patients who have questions about their care. She enjoys spending time with our patients and building long-term, lasting friendships. Michelle is originally from Chicago and now lives in East Mesa. She is outgoing and loves to talk a lot and laugh a lot! Kylie began her career in 2008 as a dental assistant and, in 2013, graduated with her degree in dental hygiene. She works hard to provide high-quality dental and periodontal care to all patients during their hygiene visits. It is important for Kylie to create a safe, healthy, and happy environment for her patients, whether they are young or just young at heart. Her goal is to make patients feel at home in our office, just like she does! Kylie and her husband Luke have a beautiful, fluffy dog named Charlie. They love spending time outdoors camping and fishing, as well as being with friends and family. Kylie also volunteers many hours at children’s dental centers and homeless shelters. Alyssa was encouraged to become a dental assistant by family members who also worked in dentistry. She graduated from EVIT in 2015 and joined Family Dental Studio in 2017. Alyssa assists Drs. Anthony, Smith and Beavers with clinical treatments and finds fulfillment in being able to help people smile again. She takes pride in her work and does everything with her patients’ comfort in mind. When she’s not in the office, Alyssa enjoys hiking, running, yoga, and spending time with her cat Andrzej. Jasmine is a fresh addition to our team! She can be found working chairside with our doctors and ensuring that patients are comfortable and receive the best care. Even nervous patients feel at ease when they’re around her! Jasmine enjoys being part of a team that has created great working relationships and a fun environment. At home, Jasmine has a wonderful husband and family with whom she loves spending all her time. She has three nephews, three nieces, and two energetic dogs!